Sixten Jernberg, twice winner (1955, 1960) of the mythical 89km Vasaloppet race in Sweden (the longest cross-country race in the world), is a revered figure in his homeland where his name is often mentioned in the same breath as the great Alpine skier Ingemar Stenmark. Nurtured from an early age at the local club in the Swedish town of Lima, his first major breakthrough came in 1954 aged 25 in the 15km race at the Swedish championships where he finished second. However, it was at the 1956 Winter Olympics in Cortina two years later that Jernberg's name became indelibly stamped on the winter sports scene when he collected four medals - including gold in the prestigious 50km race - out of an impressive total Swedish medal haul of 10. A lumberjack by trade, the Swede kept himself in top form during the summer months by spending much of his time in the forests hacking down trees. 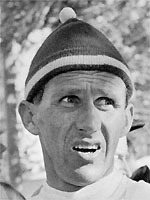 At Squaw Valley in 1960, Jernberg added to his Olympic horde - and his reputation - by winning the 30km race and taking silver in the 15km discipline. Then, shrugging off speculation that, aged 34, he might be over the hill, the perfectly-tuned Swedish marathon-man engaged fifth gear at the 1964 Innsbruck Games, cruising to gold in the 50km race, gold in the relay and, to cap things off, bronze in the 15 km race. By any standards this was an astonishing achievement bearing in mind that he already had four world championship gold medals (including two individual titles) and six Olympic titles under his belt. This last effort then gave him the record as the athlete with the most Winter Olympics medals ever, and this mark was only surpassed by fellow cross-country skier, the Norwegian legend Bjorn Dahlie. Jernberg still shares the record with Dahlie of winning a gold medal at three consecutive Olympic Games, however. The Swedes have a special place in their hearts for Jernberg and he is still one of the most popular sportsmen in the country, notwithstanding the massive presence of Ingemar Stenmark.